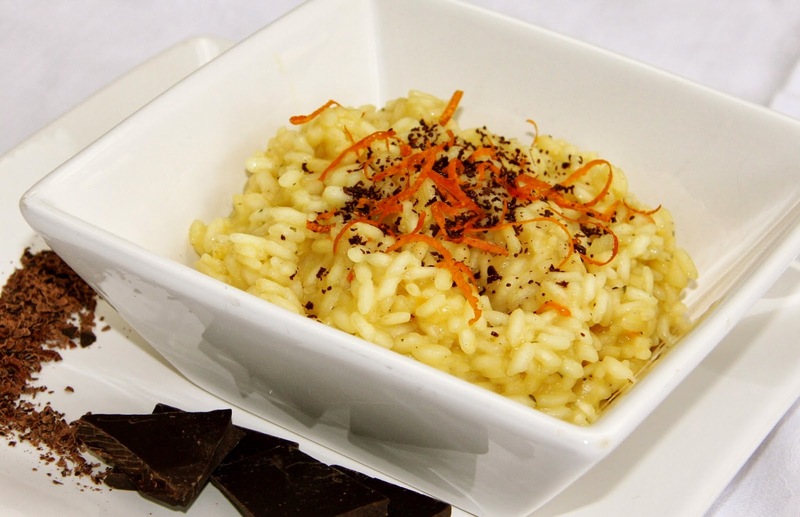 In true libabliano style, today we have cooked a savoury chocolate risotto to go with our 'Valentine Chocolate Special' class. After temptations such as chocolate soufflé, tiny melt-in-your-mouth tenerelli, a fiery chili con carne with chocolate and a gooey chocolatey chocolate roulade, we composed a risotto with an aromatic vegetable stock, laced with blood orange from Catania (Sicily) and a hint of freshly grated ginger. We finished the whole thing off with a light sprinkle of 70% dark chocolate. Yummy. A real delight and a winner. Definitely well worth a try! Bring the stock to a gentle simmer. In a heavy-based saucepan heat 30 g of the butter and the oil and sauté the onion on low heat for about 10 minutes, until softened and translucent. Add the rice and cook over high heat for 3 minutes, stirring continuously with a wooden spoon. Cook until the outside of the grains becomes translucent and the rice begins to stick to the bottom of the pan. Now pour in the wine, stir and cook until the liquid has been absorbed, 3 to 4 minutes. Pour in two ladleful of boiling stock at a time and stir frequently until the liquid has nearly been absorbed before adding more. Cook over low heat not to let the stock to evaporate too quickly. After 14 minutes, combine the orange zest and the juice; keep on adding the simmering stock, one or two ladlefuls at a time, until the rice is tender but still creamy (risotto takes about 16 to 18 minutes to be cooked, depending on the quality of the rice). When the rice is cooked (it must be al dente and creamy at the same time), remove the pan from the heat and stir in the remaining butter. Cover with a tea towel and leave to stand, off the heat, for 1 minute before serving. Serve at once, with a sprinkle of chocolate on top of each dish.